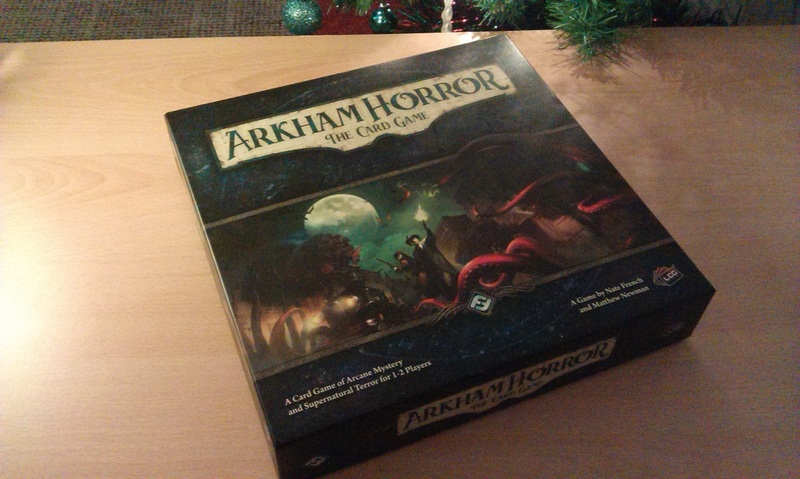 It’s time for another game day here at spalanz.com, and today I’m taking a look at the new Arkham Horror LCG from Fantasy Flight Games, having finally gotten around to playing through the campaign last week! As a warning, this is a story-driven game, and I will be discussing some mild spoilers, so if you want a totally fresh experience, you might want to skip to the end! I was off work last week for the annual pre-Christmas break, so finally spent some time learning the game. I think one of the reasons why I haven’t really gone in for a lot of new games recently is a bit of laziness on my part, as I can’t really find the time to settle down properly with a game and investigate how it all works. 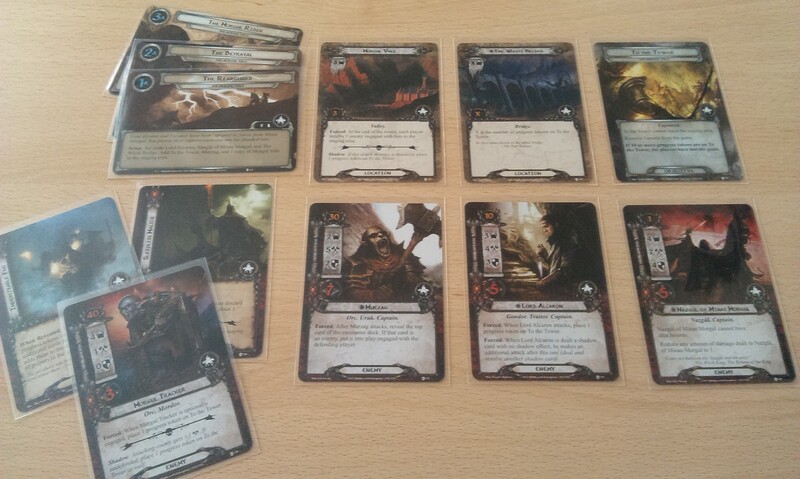 However, I gave myself an afternoon to work out Arkham Horror LCG and, I have to say, it all went off like a dream! You play an investigator looking into the mysterious goings-on in Arkham, and have three actions you can take on your turn, such as moving between locations, drawing cards and fighting monsters. When you’re done, any monsters engaged with you will fight you, then you get to draw a card and gain one resource (used to play these cards) before the Mythos Phase, where the evil agendas of the cultists are advanced and a card is drawn from the Encounter deck. These Encounter cards are either monsters or, more frequently, threat-style cards that can either have a one-time effect or a more persistent effect. 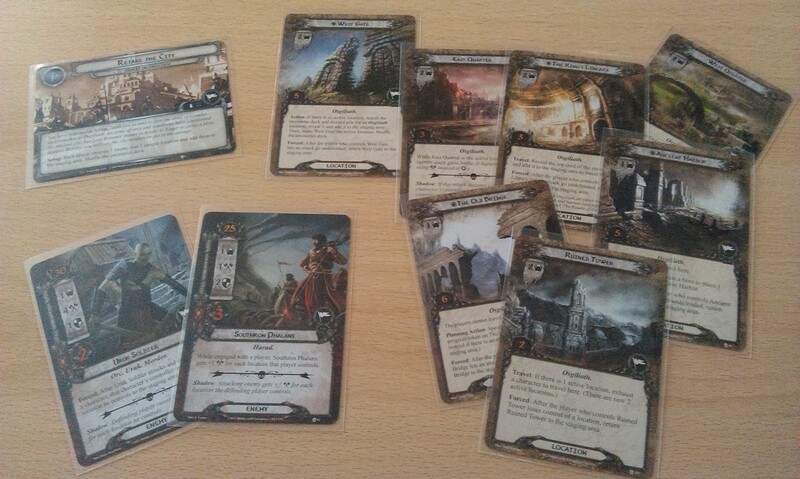 There is an Act deck that the investigators advance by spending clues, gained from investigating the locations on offer. Each scenario you play comes with specific Acts (usually three, from what I can see) and Agendas (varying numbers), as well as a scenario-specific Encounter set, then a bunch of other Encounter sets much like how Lord of the Rings scenarios are built. You need to advance the Acts before the Agendas have advanced, whereupon you determine the Resolution. There is a campaign included in the core set, Night of the Zealot, which is made out of three scenarios that build up a story of cultists trying to raise up an Ancient One out in the woods (what else? ), and each scenario features rules and events that are based on what you did as investigators in the previous scenario. So, let’s talk about the game! I just want to get this out there from the off: I absolutely love this game! I bought it a fair few weeks ago now, and can’t believe I’ve had it just lying around unplayed for so long! While saying “it blew me away” sounds a bit hyperbolic, but I can’t remember the last time I was this genuinely excited for a game. I took about an hour and a half to play through the first scenario, The Gathering, because I read through the Learn to Play booklet fully, and looked up everything to make sure I was doing it right, but quickly got into the swing of things – before immediately plunging into part two, The Midnight Masks, and following up with the final part, The Devourer Below, the day after. I don’t know if it’s because of my long history with Lord of the Rings, but I found the game to play very intuitively after the first round or so, and from what I can tell, I wasn’t playing anything incorrectly. The cards are very straightforward in what they do, and while there are a number of keywords to keep a look out for, it’s not an insurmountable task to cope with them all. 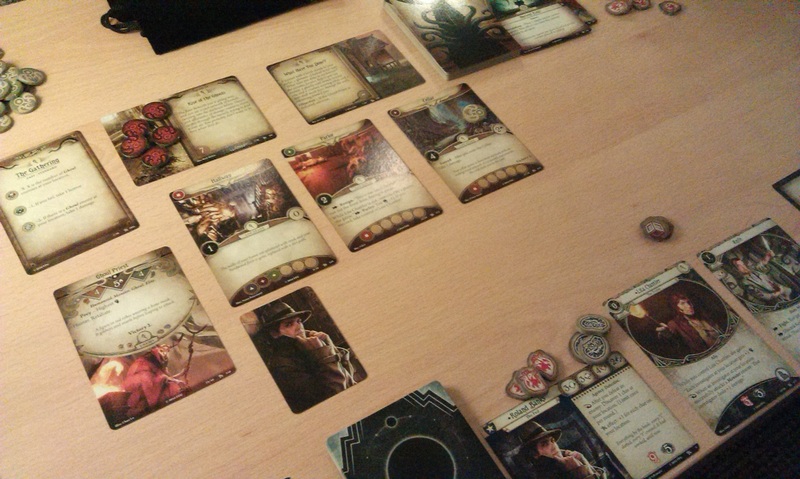 A big factor here was the fact I was playing solo, as there are a few mechanics that move monsters to the closest investigator, or the investigator with the lowest health – but that would always be me, so the choices were greatly reduced. I do credit the fact there are a lot of similarities with Lord of the Rings that allowed me to think of the mechanics in terms of the older game, which I suppose allowed me to get to grips with things quicker than otherwise possible. The theme really comes out strong in this game. 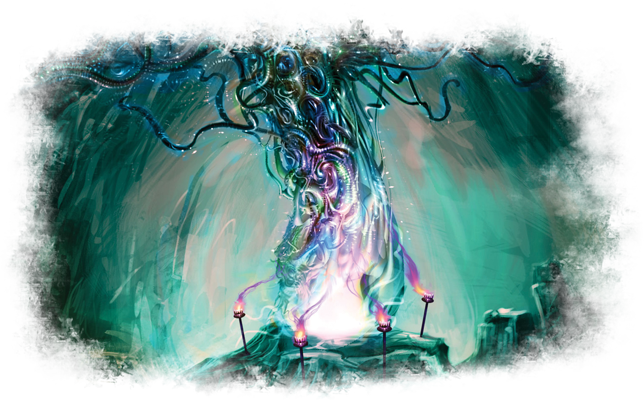 The Encounter decks are primarily event-type cards rather than monsters, which I feel better reflects the source material of HP Lovecraft’s stories, which are much more full of strange goings on than battles with hordes of gribblies. The investigator decks also feel quite thematic – I’ve played through with Roland Banks’ deck, using the starter deck suggested by the rulebook, and the mix of combat-orientated cards and investigative-orientated cards really felt right for a Federal Agent. The mechanics, as I’ve mentioned, are quite smooth and intuitive, and overall, I really love this game! But there’s got to be a down side, right? Unfortunately, right. The fact that this is a story-orientated game is both a great asset and its greatest downfall. I mentioned earlier that I played through the core set campaign over the course of two nights; I no longer feel a need to play this game again. Sure, it might be different if I’d not won, and I can always go through it again with a different investigator and see if I get one of the different Resolutions this time around. But it’s very much a once-and-done feel to it. Even before the game was released, the standalone Curse of the Rougarou scenario had been announced, and earlier this month a second scenario, Carnevale of Horrors, has also been released. This seemed a bit odd – delightful, but odd – before I’d played the game, but now that I’ve run through the core set, I can see why such standalone games have been put out. I’m not planning to play the Arkham Horror LCG again until I get a new scenario to try, either one of these print on demand jobs, or else the upcoming Dunwich Legacy expansion. I know I’m not alone in this, as there are plenty of folks on boardgamegeek and the like who have been talking in similar terms, and it does lead me to worry for the future of this game. Not in some kind of sky-is-falling “the game is over!” kind of way, but rather because I worry the designers are going to make subsequent scenarios super difficult to keep players attempting them while waiting for the next one to hit. After all, no game publisher wants their game to be played once and then forgotten about. Of course, I think this will be a really great experience, and I look forward to getting the expansions as they come out. I really hope that they continue to make these expansions thematic and not monster-kill-fests, as I feel that would be the best way to stay true to the spirit of the source material. At any rate, we’ve got two new scenarios coming in The Dunwich Legacy, which kick off the next campaign that stretches across the six packs of the subsequent cycle. Interestingly, we get five new investigators in that deluxe expansion, but the subsequent cycle doesn’t seem to offer any more – at least, it doesn’t sound like it from the previews we’ve seen. The Miskatonic Museum and The Essex County Express have both shown some really interesting player cards are coming our way, however, while the scenarios themselves would work well as standalone games as much as they’re meant to be integrated into the overall campaign. I think it’s safe to say this card game is going in a really fascinating direction, and I’m really glad to be along for the ride! Author spalanzPosted on December 20, 2016 December 13, 2016 Categories board gamesTags Arkham Horror, card games, Fantasy Flight Games, game day, LCG, Lovecraft3 Comments on Arkham Horror LCG! After what feels like a very long time, today I finished reading the Iron Warriors novel, Storm of Iron, and I have to say, I enjoyed it a lot more than I thought I would! That sentiment sounds a bit more harsh than perhaps I’d want it to be, so let me explain. Last year, I read the first two novels in Graham McNeill’s Ultramarines series, Nightbringer and Warriors of Ultramar. I’d read somewhere that the Iron Warrior Honsou appears in the series as some kind of nemesis, and has his own novel in Storm of Iron, so picked up the Iron Warriors omnibus with the intention of getting the whole story, then discovered the Horus Heresy series and the rest of that is history. I want to get back into the series though, so after looking up a reading order, I made a start on this book. The Iron Warriors are the fourth Space Marine Legion, who turned traitor during the Heresy and fled into the Eye of Terror once Horus had been defeated. While some of the traitor legions worship a particular Chaos god, the Iron Warriors have devoted themselves to Chaos Undivided, or the idea of Chaos itself rather than one of the four deities. The Iron Warriors are siege warfare experts, but were almost constantly overlooked in favour of their brother marines of the Imperial Fists. They fell to Chaos when their primarch, Perturabo, was seduced by Horus’ promise of greater glories than those offered by their father the Emperor. Storm of Iron tells the story of the Iron Warriors’ siege of the citadel of Tor Christo on the planet Hydra Cordatus. Led by the sinister Warsmith, the Chaos Space Marines are intent on something within the citadel, but precisely what remains unclear for most of the novel. Leading the ground assaults are three of the Warsmith’s captains: Forrix, Kroeger and Honsou. Forrix is the hoary veteran of countless battles, while Kroeger is a berserker of Khorne and Honsou is almost universally reviled as a half-breed, his blood tainted with that of the Imperial Fists. The novel is basically the story of this siege, with the back-and-forth of the Iron Warriors attacking the citadel, being pushed back, attacking again, being pushed back again, then making a final all-out assault. It’s not really the sort of story that I enjoy – I usually go for much more varied and, dare I say, interesting stories with a lot of plot to them, and so I was a bit dubious once I’d gotten partway into this book. However, the story is peppered with all manner of small-scale stories as we learn more of the defenders on the bastion and the Iron Warriors themselves, making the tale really very compelling! I’d expected Honsou to be something of a self-indulgent type, because of his tainted provenance, but he’s actually an interesting chap because he just wants to get the job done. Forrix and, particularly, Kroeger, are much more irritating for being “pure” Iron Warriors. There’s an interesting side story with Kroeger that I don’t want to spoil here, but I definitely found to be intriguing, especially as it went on! We don’t get to learn a great deal about the Warsmith, he’s mainly an overlord type of big baddie who happens to be intent on daemonhood. This desire to ascend to become a daemon prince drives the story along, as he wants to conclude the siege quickly. The most remarkable thing about this novel, for me, requires me to spoil the ending, so I apologise in advance for that: the Iron Warriors win. The novel is about them, and they’re evil, but we spend so much time with the guardsmen on the bastion that I began to think they would somehow carry the day – but no, the Iron Warriors obtain their objective, and leave the planet in smouldering ruins. I was surprised by this because it was kind of unexpected! But there you have it. It’s a story where the bad guys get what they came for, and so the Warsmith ascends to become a daemon prince, and names Honsou as his successor. Despite the idea of a book that is a pretty grueling siege, I really enjoyed it, having had my interest in the legion piqued after having read so much about them during the Beast Arises series. I think the ending really paid off, even if it is an unorthodox evil-triumphs type of ending, and I was really impressed overall! All in all, I really enjoyed these two stories. I find it kinda fascinating to see the weird alchemy of Chaos at work, the way the use daemons bound to machinery and stuff. Doesn’t seem to be something other traitor legions use, or at least not in the same way, anyway! Author spalanzPosted on December 19, 2016 December 18, 2016 Categories WarhammerTags Graham McNeill, Iron Warriors, Warhammer 40k2 Comments on Iron Within! Week 50 of hobby progress is upon us! Can you believe it? Well, here it is, anyway! I’m just so surprised because I hadn’t actually thought it would keep me going for the whole year by simply posting updates of my progress like this, but, well, it has! Week 50 has actually been kinda slow, which is a surprise considering I had the week off work. But even so, progress has been made, so I can’t really complain on that front! First of all then, let’s take a look at what I’ve been painting. Novamarines have been a theme for a couple of weeks now, and I’m now calling these guys done. I’m not 100% happy with them, but I think they’re as good as I can get them now, and anything more will just be making a mess of the buggers. 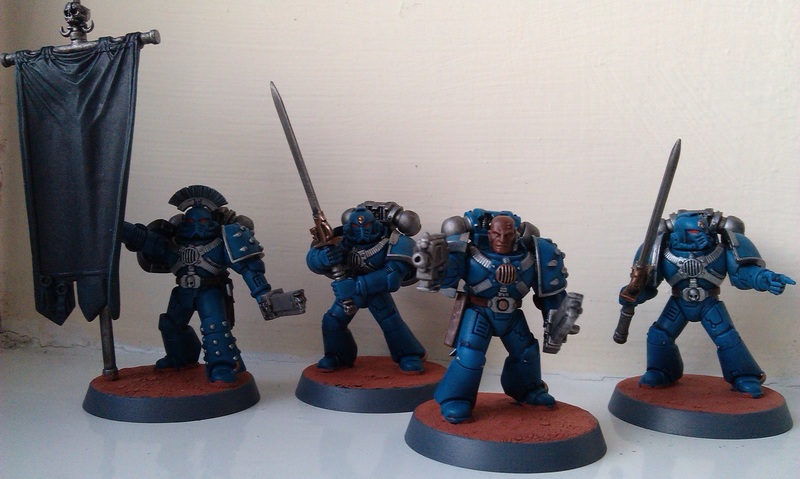 They do look somehow better in real life, I think, though I could probably do a better job with highlighting the blue. 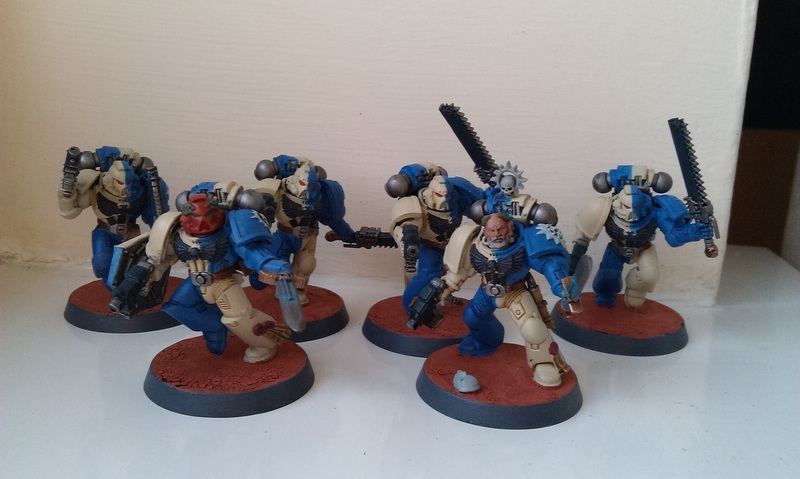 I’ve done the laurels in the usual Ultramarines scheme, and have painted the chapter badge with Celestra Grey, which I think looks good but I might end up going over it with White Scar as it is supposed to be a stark white. But anyway, for now, these guys are finished! I do have the dreadnought still to finish off, and I have four tactical marines that now need to be painted as well, but I think I need a bit of a break from all the quartering! The Alpha Legion stuff I’ve had on the go has been going pretty well, too. First off, the Corvus-Alpha tactical support squad is pretty much done, I just need to sort out this attempt with OSL! 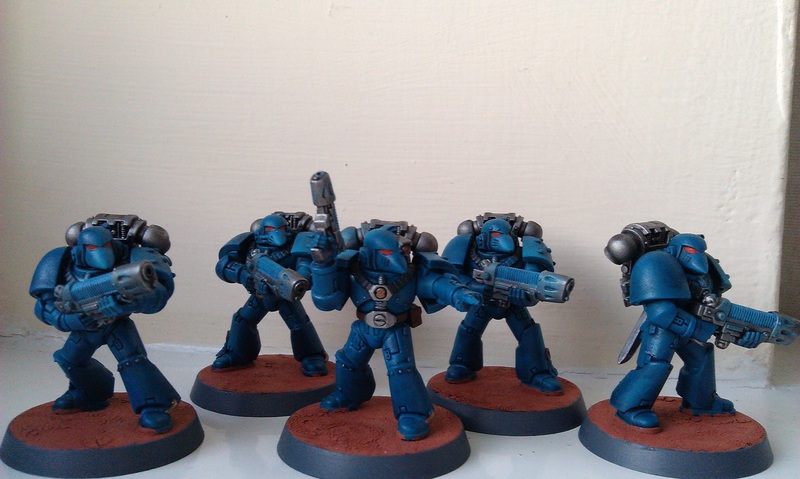 I’ve painted the plasma coils with Caledor Sky, shaded with Drakenhof Nightshade, then layered over with Temple Guard Blue, which I’ve then stippled and lightly drybrushed over some areas of the armour to make it look like the plasma is lighting up those areas. Unfortunately, the armour already has that teal/turquoise look to it, to it blends in a bit too much and hasn’t had much of an impact! I’m going to go back in with something like Baharroth Blue though, so maybe that will brighten the whole thing up. The Command Squad has gone pretty well, I have to say. The banner is causing me the most problems, unfortunately – because I’ll need to attempt some freehand on it! I’ve found some inspiration online for the colour of the cloth, at least, so have gone in with a mix of Abaddon Black and Eshin Grey to have that really dark grey look to it, then went back and very lightly highlighted the edges and folds with Kabalite Green. It’s an extremely subtle look, but I think looks nice! I’m going to do the simple alpha/omega logo rather than try to paint the three-headed hydra thing, anyway, and I’ve seen some fairly easy ways to paint the unbroken chain logo as well, so want to try that on there also. Hopefully it won’t turn out like total crap, anyway! The Centurion has pretty much been finished, as well! I’ve painted the face as I’ve been trying to do all of my bareheaded chaps in the legion, Doombull Brown then shaded with Reikland Fleshshade, which has given a bit of a coppery look, then highlighted with a Doombull Brown/Karak Stone mix, which has provided a bit of a highlight without losing too much depth. I’m still too terrified to paint eyes, but I’m fine with that. I’ve tried to keep him standing out from the rest of the legion by keeping things like the backpack the turquoise colour, and have taken the time to pick out all of the rivets on his armour with Leadbelcher, which has taken forever but does look quite striking, I think! So I’m definitely getting there now! All in all, then, I’ve got 300 more points to add to the collection! The Centurion hasn’t been upgraded, while the two Chosen in the Command Squad are both equipped with charnabal sabres. The whole foursome comes to 170 points, while the tactical support squad with plasma guns comes to 175. So added to my existing army of 1270 points, I’m now up to 1415 points overall – but still no legal force organisation, as I still only have one troops choice! So I think I need to work on a second tactical squad next, and get moving on that!! However, I have been building up a whole load of stuff! Because obviously! Let’s continue with the Alpha Legion theme for the moment, and talk about the drop pod I built yesterday. This thing was really nice to finally get built up, since I’ve had it waiting for a long time now. (Well, technically, I bought the drop pod for my Deathwing, but anyway). It’s certainly an iconic miniature for any space marines army, and while it was nice to get it together, I can’t say it was fun to actually build. Pretty much all of the large pieces were an absolute nightmare to clean. The five pieces of the main structure, I don’t know what you’d call them, they were attached to the sprue at something like 9 gates each, which means an excessive amount of rubbish to clean off. The doors seemed a bit better, though I will never understand why they can’t make these in one piece. Tank armour, fair enough I’ve made my peace with that being in two sections, but drop pod doors? Hm. I think the most annoying part of it all, though, is that three of the doors don’t actually close – one of them keeps falling open all the time, actually. From what I can tell, it isn’t out of alignment, but there we have it! So I’m not a fan. It does look cool, don’t get me wrong! I just wish it went together better! This past week has mainly been about Genestealer Cults, however! I went up to GW on Wednesday looking for a big kit to have some kind of project for my week, and settled on the Hydra. I’d had my eye on this thing for a while, mainly because I love the fact there’s a guy in the back trying to make sense of the instruction manual, and thought it would be perfect for my cult. Of course, Hydras and Wyverns aren’t in the Cult codex, but you can ally with the Astra Militarum and get one that way. So I was all for it. I spent some time talking over my plans with the guy in the store, and have settled on building it as a Wyvern for the troop suppression rather than the anti-air Hydra build. The kit was amazing, anyway, and went together so much better than the drop pod! 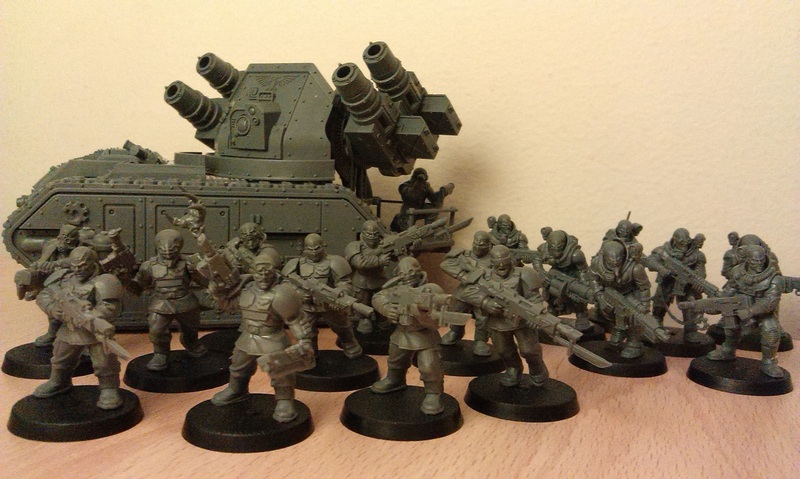 I started to build it up on Wednesday afternoon, only really intending to build up the two guys as Genestealer Cultists, but eventually built the whole thing! The allied detachment doesn’t have a lot of scope for adding stuff like this to it, unfortunately, but I am kinda tempted to get a full squad of three just because I love the kit so much! Of course, having that does mean I need to look at my allies now. I’ve settled on buying a Start Collecting AM box, as I think it would be hilarious to get the Commissar built up as a Neophyte Hybrid as well! In talking over these plans at the store, it occurred to me that the Primus does have a vaguely Commissar-y look to him, of course, so it isn’t entirely beyond the realms of possibility! So I think the Commissar, the troops and the Wyvern will be in my allied detachment, then the Leman Russ from that Start Collecting box can be taken by the Cult anyway, so it does actually work out really nicely! The only problem, of course, is having enough heads for the entire box to be kitted out as Cultists… Even though they will actually be AM and not Cult, that’s more from a rules perspective than an army perspective, and I want them all to be cultists deep down! Finally, it’s my birthday today, and I’ve given myself this bad boy to celebrate! It’s my current dream to build up every single weapons option for the Deathwatch chaps, so that when I come to assemble a squad, I don’t need to have any kind of “yeah, he counts as x” or whatever. The terminators and the bikers – even the rhino – are useful for whatever marines I end up building, of course, so I thought the saving of £70+ in this box made it worthwhile in the long run. So that’s the plan for 2017! Everything wrong with Rogue One? So, movieweb has published an article listing 13 problems with Rogue One, and I thought it was interesting enough to want to write a blog here with some of my own thoughts on these problems. Because I’m still pretty pumped for this movie, and I’m interested in what’s being written about it! I have to say, I hadn’t really thought a lot about this one. My biggest problem with Vader in this movie was the costume, which somehow didn’t seem right. I actually really liked that scene at the end with him swinging his lightsaber into all and sundry, it was pretty great. But like the article says, it does make the Vader of A New Hope seem a bit diminished by comparison. The depleted battery theory is pretty good to explain this, but it harkens back to what I said after watching the first trailer, and how I feel seeing new stuff from this period of the timeline will make the original trilogy seem pretty dated. So in short, I agree. I didn’t honestly think this was as badly done as the article describes. Sure, as I said in my review blog from yesterday, the scenes with Tarkin distracted me because I was trying to work out how they’d done it, but overall I liked seeing this, and thought it worked really well. To have a film about the Death Star without Tarkin would have been more jarring, to me, so I appreciated the efforts to stay within the lore, anyway. Seeing Leia at the end was a shock, and I’m not even sure it was a good shock, but I don’t think it was that much of a deal overall. I actually really liked this one. These anthology movies are trying to break the mould for what a Star Wars movie has to be, and the lack of an opening crawl/rebels’ fanfare – heck, the title card of the movie just says ‘Rogue One’, it doesn’t even have Star Wars on the screen. This really does feel visually different, and I like it. Having the planets introduced in this way was something that made me pay attention, but it also made me feel like I was watching a different kind of movie set in the familiar universe, and I really liked that feeling. Overall, I don’t see anything wrong with this! Sure, this bugged me a lot. I just didn’t see the point of it, beyond the obvious fan service. It had no other purpose, and is the sort of thing that bugs the hell out of me in movies like this. The issues with them getting from Jedha to Mos Eisley in a matter of days is the least of my concerns here, they just shouldn’t have been put in the movie in the first place. While I was a bit surprised at how easily Chirrut and Baze grafted themselves onto the rebellion, overall I didn’t have a problem with the formation of the team. The far larger problem, for me, was how Jyn suddenly becomes an inspirational leader-type during the “senate” scene and subsequently on the mission, while we’re told Cassian is head of intelligence and so would more likely fill that role more naturally. Maybe it was a part of her character that she had kept hidden up to that point, and it was finally allowed to come forth, but she does go rather too quickly from the sullen loner type to a Princess Leia surrogate. Hm. This plotline was a bit weird to me, and I felt it was a little like the stuff with “the Force of Others” and “the Temple of the Whills” that I mentioned in my review blog, there for the fans of the lore familiar with the genesis of A New Hope, back when it was the Adventures of the Starkiller and so on. It seemed like something that was floating around in the background, and I was surprised that nothing ever came of Jyn’s necklace. In fact, I was surprised we didn’t learn anything about her mother, who is perhaps also one of these Church of the Force types. Or maybe even a Jedi in hiding? Maybe that’s something to be discussed in a future comic or novel? Hm. 12. Back to the Future? Sure, now they mention it, this moment does have that feeling. But it isn’t something I’d thought about during the movie. In fact, I was pretty convinced Bodhi Rook was going to prove he wasn’t, in fact, a defector, and was going to sell the rebels out after all. I was genuinely surprised that he turned out to be a good guy! Anyway! This surely won’t be the last post about the new Star Wars movie on this blog – I’m hoping to go see it again, and have the novelization on pre-order, at the very least… Have you seen it yet? Let me know what you think in the comments! Author spalanzPosted on December 16, 2016 Categories Star WarsTags Rogue One, Star WarsLeave a comment on Everything wrong with Rogue One? 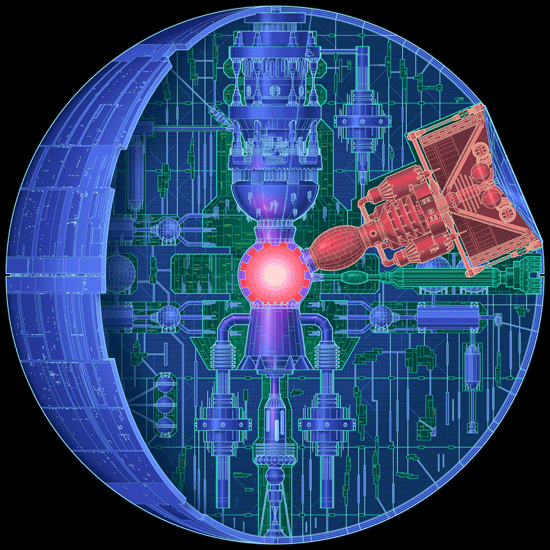 Following on from my moderately spoiler-filled review of Rogue One yesterday, I thought it’d be fun to take a look at how the Rebel Alliance originally got hold of the Death Star plans in the old, now-Legends canon! Sit back and enjoy the crazy! First of all, it’s important to note that the story was told over a number of years and via a number of media, including video games. This is important, because of the nature of such things. Back in The Force Unleashed, Vader’s secret apprentice captures the leading senators behind the rebellion and takes them to the skeletal Death Star building site to, well, kinda gloat. Over the next couple of years, the rebellion learns of the battle station’s capabilities and decides to steal the plans in the hope of finding a weakness and destroying it. This whole process was called Operation: Skyhook. Initial rumours of the project were passed to Princess Leia while she was on a mercy mission to Raltiir, and investigations were carried out by Captain Raymus Antilles – with the unlikely assistance of none other than Han Solo… Anyway! The investigations turned up the location of the plans for this station at Danuta, and so Mon Mothma assigned the mission for their recovery to the Imperial defector, Kyle Katarn. In addition to this, plans were also recovered on Polis Massa, where the 501st Legion attempted to recover the leaked information. Datacards with information about the Death Star were also sent to Darkknell, where they were recovered for the Alliance by Garm bel Iblis. These plans were discovered to be incomplete parts of the whole schematic, which was said to have been split for security purposes. A fourth part of the plans were recovered on Toprawa, where the superlaser had been developed, and were recovered by Bria Tharen and Red Hand Squadron, where they were beamed to Princess Leia aboard Tantive IV shortly before Darth Vader’s flagship, the Devastator, arrived in the system and began the chase that concludes over Tatooine in the opening of A New Hope. This whole story is principally told in the Dark Forces, X-Wing and Battlefront video games; as well as the novella, Interlude at Darkknell, and the end of the Han Solo trilogy, Rebel Dawn. The video games have gone over this material so often because it is a pivotal episode of the Star Wars saga that has “game opportunity” written all over it. Needing to have a reasonably open-ended storyline has also led to a few problems, and the whole situation has caused the almost-endless retcons that have happened over the years, in turn causing the story of the theft of the Death Star plans to have become a weirdly mutable part of the overall storyline. The storyline outlined above has actually been told over the course of several years, and painfully refined to allow for the inclusion of any new scrap of information as it became published. Thankfully, with the release of Rogue One, we have one coherent narrative that shows us what is now considered to be the true story, and I have to say, it’s actually a lot better than I thought it would be! I’ve literally just gotten back from the cinema, having been to the 10:15 showing of the new Star Wars movie, and I have to say, that was one hell of a film right there! Rogue One tells the story of how the Rebel Alliance got those Death Star plans that we see Princess Leia racing across the galaxy with at the start of A New Hope, and it’s a story that has really been done to death back before the days of the story group. I am going to talk about some of the story of the movie, so please don’t read on if you’ve not yet seen it and want a surprise! Just know that the movie is really great! The film is just amazing. This is the first of the new breed of Star Wars ‘anthology’ films, which will deal with stories outside of the central saga of the Skywalker family, and focuses on a cast that is pretty much entirely new to the lore. Having grown up with stories like the Jedi Academy trilogy, which tells of the scientist Bevel Lemelisk and his team of weapons experts who developed the Death Star, I must admit I was a bit hesitant to like this film, as it was stripping away so much of what I had come to think of as the Star Wars storyline. But, much like stories like Bloodline, I think this film succeeds in providing a more cohesive, and just plain better, story for this aspect of the lore. Jyn Erso is a fairly compelling character, though at times I thought the role was a bit of a cypher, and merely existed to tell the story around her. There is definitely something there, however, and either a second viewing or something like the novelization will perhaps change my opinion. The head of Rebel intelligence, Cassian Andor, was much more interesting, and I would definitely like to see more of his involvement in the nascent Rebellion. Hopefully this is something dealt with in the novel Catalyst, which I plan to read soon! The more peripheral rebels we get in the group, Chirrut Îmwe and Baze Malbus, were much more interesting to me, former guardians of the Jedi temple on Jedha that is being stripped of its kyber crystals, the fuel required for the Death Star superlaser. 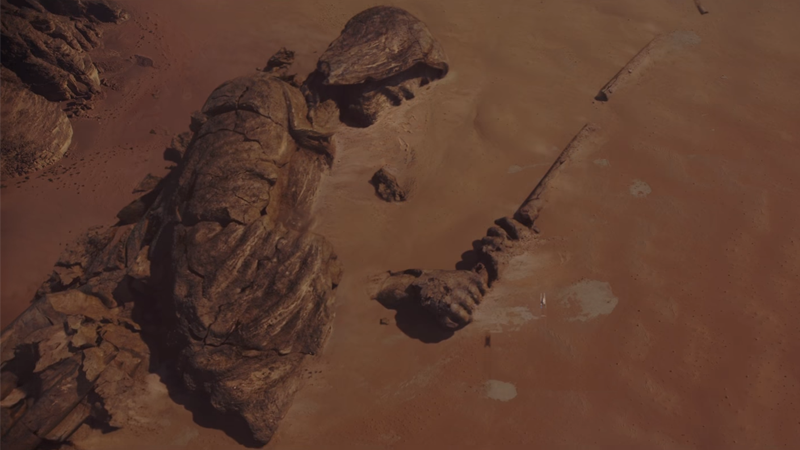 I have to say, the addition of kyber crystals, as well as mention of the Temple of the Whills, were a nice addition for fans of the lore of the original movie, but felt a bit like they were only included to make us fans of said lore “oooh” at the words. Similarly, how Chirrut initially says “May the Force of Others be with you”, which was the original greeting/blessing/whatever. But these are minor gripes. The main thing here is that the new movies are restoring the spirituality of the Force to the mythos, rather than going with the scientific explanation given in the prequels, and I have to say that I absolutely love it. I actually expect Disney to come out with the message that episodes I-III aren’t actually canon at some point, as I find it very suspicious that they’re focusing all of their attentions on the period of the original trilogy and afterwards, and now working to unravel things like midichlorians. It’ll be interesting to see, anyway. The locations of this movie are worth mentioning at this point. We get a handful of new planets, centring on the spiritual planet of Jedha, and the Scarif base at the end. I really love the locations of these movies, and I was not disappointed! 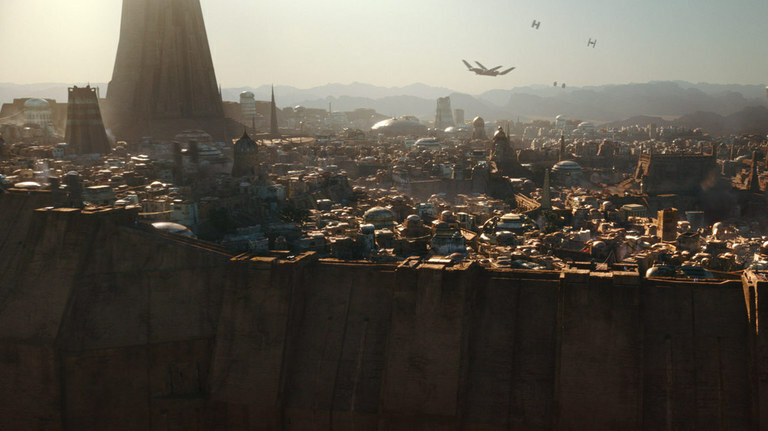 Jedha (above) is a desert world with a Mos Eisley feeling to its main city. There is a religious centre kind of feel to the place, with huge broken statues out in the wastes, and what seem to be pilgrims wandering the streets. Of course, the place is under Imperial cordon, due to the kyber crystal thing, and is the base of Saw Gerrera and his attacks on the Imperials. 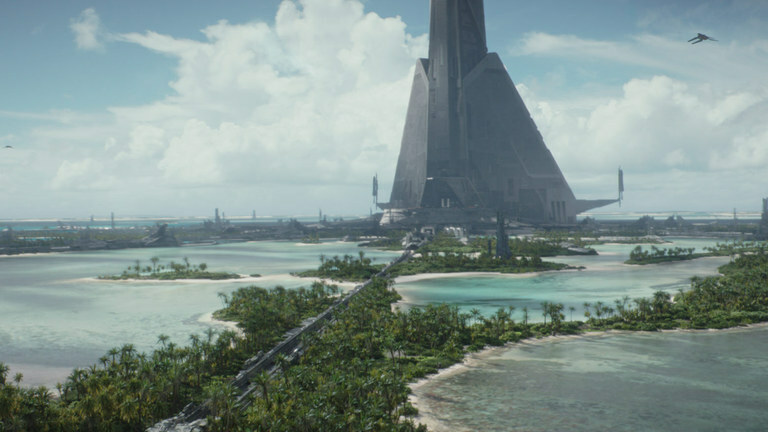 Scarif is a more tropical kinda place, which perhaps looks too much like the islands of the Indian Ocean, but what the hell. It’s here that the Imperial records are kept, and where the Rebels infiltrate to steal the Death Star plans. AT-AT walkers on the beach, ahoy! Speaking of Imperials, our main villain is Orson Krennic, the man in charge of the development of the superlaser technology, it seems. An ambitious Imperial, I found him to be fairly interesting, particularly his place in the command structure under Grand Moff Tarkin. I have to say, I had no idea that the movie was going to resurrect Peter Cushing for this, and the CGI was actually pretty amazingly done. Unfortunately, things like this do tend to drag me out of the story, as every scene he was in made me focus on how they did that – was it CGI? Was it just a very good double? It’s going to be worth watching again to actually pay attention to the scenes this time. Along with the return of Cushing and Vader, we get Bail Organa and Mon Mothma, reprised by Jimmy Smits and Genevieve O’Reilly respectively. While Mon Mothma has been in the trailers, I was excited to see Smits once again, as it lends a lot of nice continuity to the movies. I think there was a guy who was supposed to be General Dodonna, but can’t be sure of that… It was really nice to see more of Yavin IV, anyway, and I actually enjoyed seeing things that reminded me of A New Hope – though there are several shots of the rebel pilots from the Death Star trench run sequence repurposed for the attack on the Scarif shields, and that kinda jarred a little too much for me. Overall, I really enjoyed this movie. It had a very gritty feel to it, and in fact felt incredibly grown-up for a Star Wars movie. The galactic scope of the film was really well-done, and the characters were interesting enough that they could sustain a movie that we all know the ending for. Perhaps even more so than The Force Awakens, I found myself enjoying this movie from the outset, and really want to learn more about things like Jedha and the Church of the Force. It’s another game day here at spalanz.com, and it’s time to return to one of my absolute favourite games in the history of the world: Lord of the Rings LCG! It’s been more than a year since I took a look at the deluxe expansion, Heirs of Númenor, so it’s time to look at the subsequent cycle! Against the Shadow was released throughout 2013, and subject to some hefty delays here in the UK. The first pack in the cycle, The Steward’s Fear, was actually the first game I had delivered after I moved into my new flat! As I said in the last blog, the narrative possibilities of the game were really embraced in Against the Shadow, with the designers – including company CEO, Christian Petersen – developing a story that involved us solving mysteries on the streets of Minas Tirith, defending the outpost of Osgiliath, and ultimately, into the shadow of the Black Gate itself! 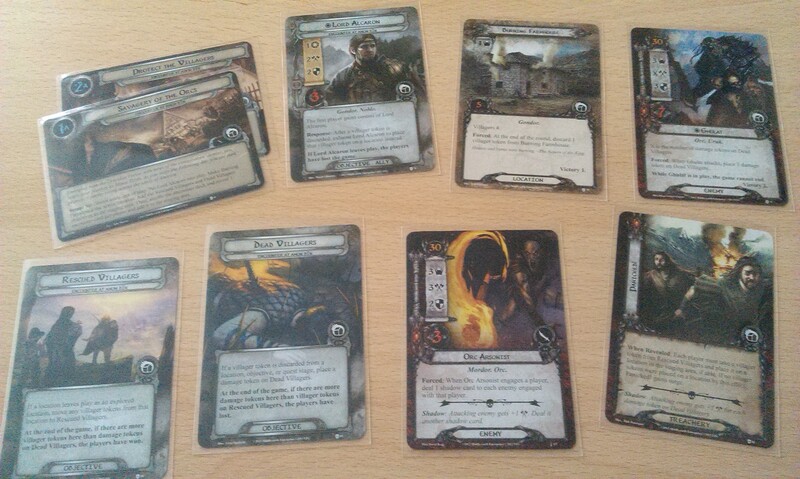 The player cards in this cycle were fairly decent, mainly involving an effort to support mono-sphere decks and pushing both the Gondor and new Outlands traits. This latter deck type became extremely powerful quite early on, with a series of allies who were buffed by having other Outlands cards in play. 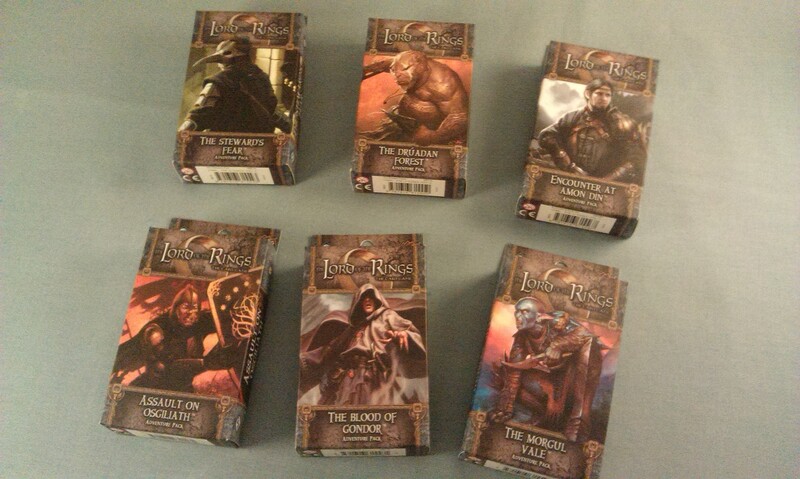 The heroes were a bit of a mixed bag, and includes the first original hero for the game since the core set, Mirlonde. 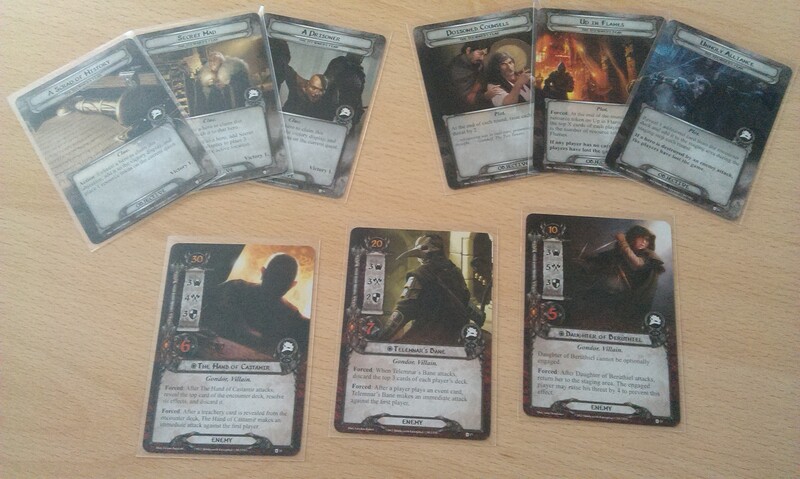 As usual, however, I’m more interested in the scenarios than the player cards! This scenario remains, for me, one of the most narrative games in the entire Lord of the Rings product line to date. There are three modular elements to the game: a plot, an archenemy, and a series of clues. The idea is that you are travelling around various locations throughout Minas Tirith, trying to discover a sleeper agent from Mordor. Most locations are “underworld” locations, which are placed in the staging area with a number of cards face-down beneath them. As you explore these locations, the cards are turned face up, and can either be enemies, or clues. As you progress through the game, you will first uncover the plot that has been put into effect, before finally uncovering the villain himself! This is a really prescribed scenario, with an especially detailed set-up. As such, it can be a really great, thematic experience, but also sometimes you just want to explore somewhat at your own pace, which is why I always find myself returning to the Mirkwood scenarios… It’s a really good expansion, however, and well worth taking the time to explore! This cycle was the first to employ a narrative focus at the forefront of the game. Rather than having an overarching plot that didn’t really have much of an impact, the adventure packs each having a story that you get to read when you finish the adventure that describes what happens next. The Drúadan Forest takes place as part of the heroes’ chasing the villain out of Minas Tirith before his true identity was revealed. The scenario sees us going through the forest, much like Into Ithilien from the deluxe box, but this time we’re set upon by the Woses rather than the Haradrim! Again, there is a prescribed feel to the game as we have the big enemy kept aside until later in the scenario, but overall it’s a fairly standard game. Every cycle seems to have one of these sorts of quests, which feels super-thematic but is almost entirely written off by the majority of gamers as “too easy” or whatever. True to form, this scenario is one of my favourites from Against the Shadow, as well! Returning from the forest having seemingly shot all of the conspirators full of arrows, the heroes come across the village of Amon Dîn being attacked by Orcs! 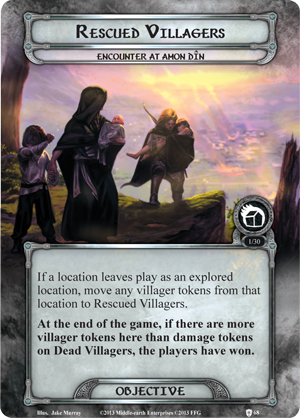 This scenario features the really great Villagers mechanic, where locations come into play with resource tokens on them to represent a number of villagers: when the location is explored, the villagers are rescued and placed on the appropriate objective card. 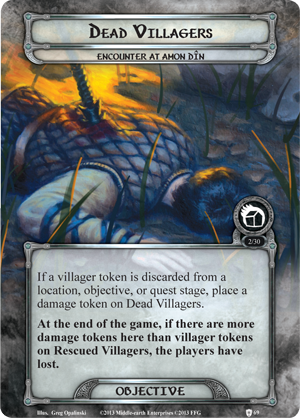 There are a number of cards that will remove villager tokens from cards, and deal damage to the “dead villagers” objective card. The object of the game is to rescue more villagers than see villagers die. I really like this, as I said, and it feels really thematic when an Orc enemy shows up and starts dealing damage to the villagers before you can slay him! The scenario is also the first in the cycle that gives us the objective-ally card of Lord Alcaron, whose scroll was so important in Peril at Pelargir! 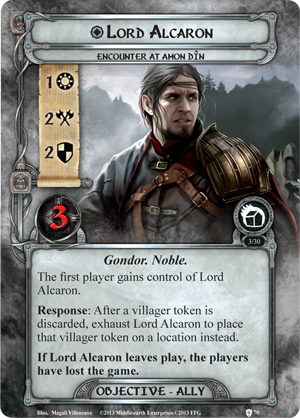 Lord Alcaron is a character invented for the game, and functions similarly to Arwen in the previous Dwarrowdelf cycle, where if he is leaves play, we lose the game. Alcaron can be exhausted to rescue a discarded villager token, which is really useful in this scenario, but his effects will change as we meet him in subsequent scenarios! I said that Encounter at Amon Dîn was my favourite scenario from this cycle, but Assault on Osgiliath runs it a very close second. This scenario is also one of the strangest put out in the entire history of the game, if I’m honest. In the narrative, we’ve saved the villagers and have now hooked up with Lord Alcaron, and we go off to Osgiliath to help Boromir re-take the beleaguered city from the Orcs. This is represented by the heroes literally taking control of explored Osgiliath locations as the game progresses. When an explored location leaves play, it goes into the victory area, but there are numerous effects that depend on how many locations we control, such as enemies having +1 attack or whatever. However, in order to win the game, we just need to control all of the Osgiliath locations in play: set-up requires us to place one such location in the staging area at the beginning but, feasibly, that may be the only such location we turn up, so the game can be over really, really quickly! Even so, I love the thematic tug-of-war we have with locations coming under our control or then leaving again. It’s a really great scenario, and possibly the one I’ve returned to most often since its initial release. This scenario sees us pursue the Orcs after successfully purging them from the city of Osgiliath, running back into Ithilien and right into an ambush! Lord Alcaron is back, this time he can exhaust to return enemies to the staging area, which can be a useful thing. We also get an objective-ally Faramir, which had fans up in arms at the time because the hero Faramir came out in the previous scenario! This scenario involves the Hidden Cards mechanic, where the players take one card from the encounter deck and place it face down in the play area. This represents the forces of the enemy lying in wait. 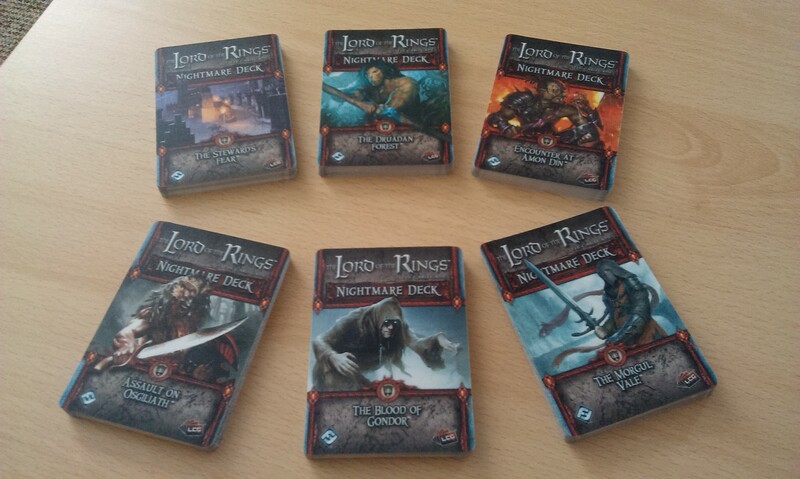 We also have the iconic Black Númenorean enemy in this pack, which initially excited me as I thought we were getting the Mouth of Sauron himself! But alas, this is just one of the many sorcerous men from the north. Anyway, there are a lot of cards, such as the Black Númenorean, that have a greater impact depending on how many hidden cards are in play. 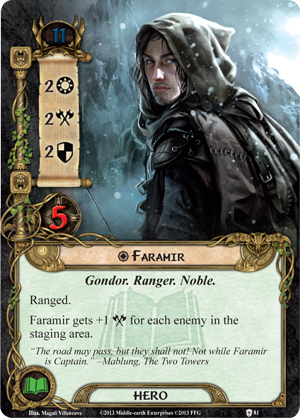 Objective-ally Faramir is another such card, who can deal 3 damage to an enemy card if one is turned up from a hidden cards pile. 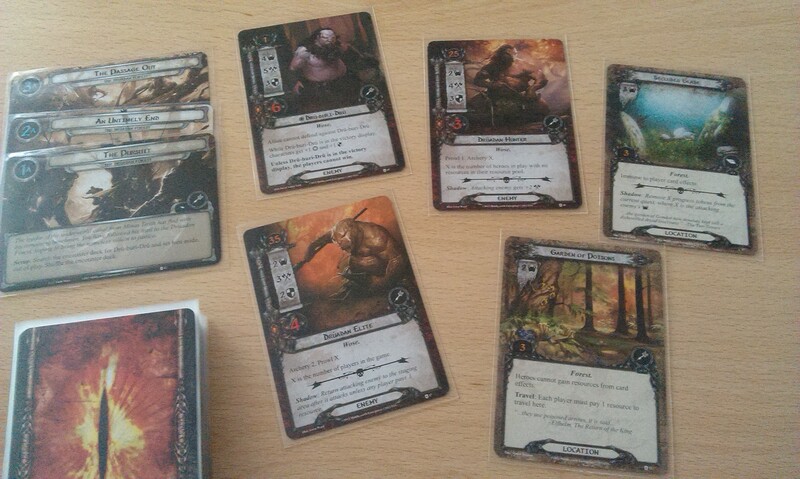 From the second stage of the quest, Alcaron and Faramir are both captured, and all hidden cards are turned face up. The players then need to quest using their attack value, something from Heirs of Númenor that has featured somewhat sporadically throughout the cycle, in order to win. 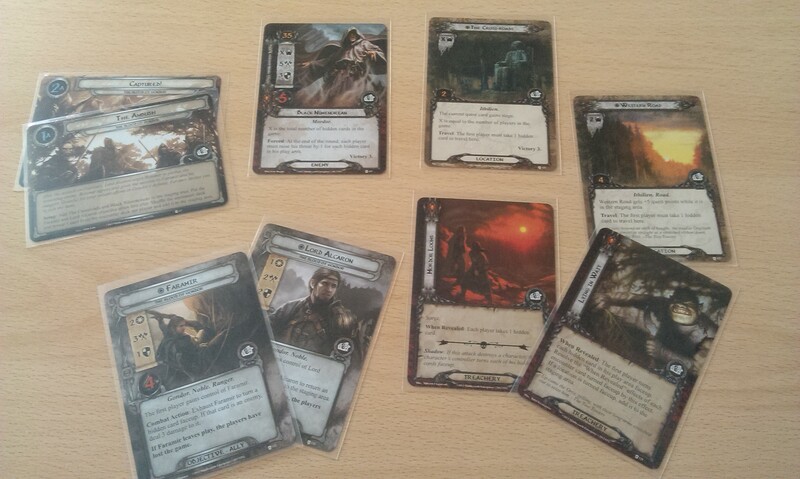 The final scenario takes us to the Black Gate of Mordor itself, as the storyline of the cycle plays itself out. Another prescribed scenario that throws increasingly difficult ‘captain’ enemies at the heroes in order to prevent their recovery of Faramir, it reveals that Lord Alcaron is a traitor to the free peoples of Middle Earth! Each of the captain enemies needs to be destroyed in order to make it past each stage, with the demise of the final, Nazgul enemy winning us the game. The Nazgul has the usual effect of reducing all damage dealt to him to 1, which is wonderfully in-keeping with other iterations of these enemies in the game, but horrible when you’re trying to win! There is also a timer element in To the Tower, which will lose us the game if it has 10 or more progress tokens on it. 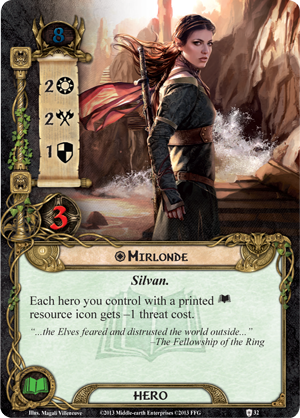 There are all manner of cards that are trying to place progress on this thing, and I think it’s actually an incredible implementation of this war on two fronts thing: we’re trying to rescue Faramir, but we’re having to fight our way through the Orcs to get to him. 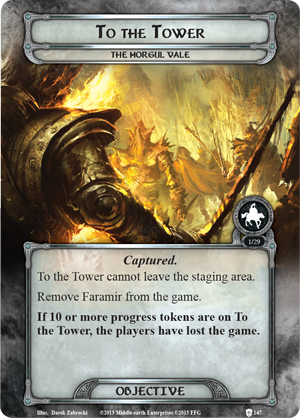 The scenario is difficult, I have to say, and once again can’t have Faramir in play, but it’s a really incredible way to finish what has been a really immersive cycle. The nightmare packs for this cycle are, as can be expected, truly nightmarish, with all manner of unnecessary horrors added to each scenario! There are new Plots and new ways of interacting with the Villain in The Steward’s Fear, while the Drúadan Forest gives each hero five resources at the start of the game, and you can’t collect any more! 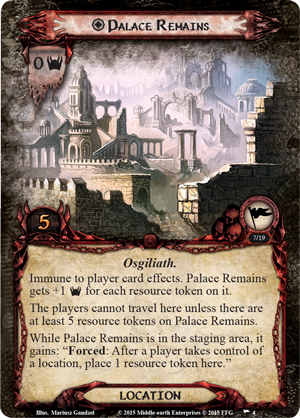 Something that I really like about the Assault on Osgiliath nightmare deck is the additional Osgiliath location card, Palace Remains, which prevents you from claiming it until you have at least five other Osgiliath locations. This can drag the scenario out enough that the true tug-of-war feel comes to the fore. While I still love the Mirkwood cycle dearly, and I don’t think anything can truly knock that cycle off its lofty perch, Against the Shadow is an incredible cycle, with some wonderfully thematic storytelling – which is precisely what this game is all about, for me. Author spalanzPosted on December 13, 2016 December 13, 2016 Categories board gamesTags card games, Fantasy Flight Games, game day, Lord of the Rings LCG1 Comment on Against the Shadow!